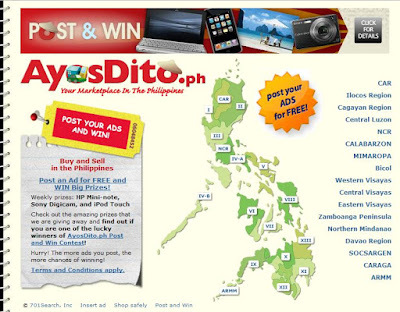 If you have been around online for a while you may have noticed the ads all around the internet of this big company www.AyosDito.ph and how widely they are advertised. Well, I have and am impressed by their advertising capability. This site, I believe, is based here in the Philippines and, I think, is pushing the online shopping industry to become more popular. I have a brother-in-law who did his shopping through this site and I myself have tried visiting their web site and have found many different kinds of items. They have items from men’s shoes to digital cameras. The nice thing about shopping through this online shopping site is they have so many items available locally. But, of course, as e-commerce becomes more popular, the risk of this being abused also increases. I haven’t really checked in their web site but I hope they also have planned some security procedures against scammers to minimize the risk of people getting victimized. So, as I look for new items like gadgets, laptops (yes, my wife and I are planning to purchase an external hard drive and eventually a laptop) and other stuff that are available locally, their web site is definitely one of the sites to go to. Seems like a big business indeed with a wide variety of products available. Thanks for introducing it. Nice blog. I am looking at your page to see your contact form or email address to contact you privately. I am Luwi of Merkado Network and we are inviting bloggers/site owners (especially filipino bloggers) to our money earning program in Merkado Shopping Network.